It's Friday and I've almost made it through this week. I feel like I never manage to recover from the exhaustion of last weekends travels and I felt like I was getting a cold. Every morning was a struggle to get up and out the door, and finally yesterday I gave in, called out of work and slept all day. I need to resolve to take better care of myself, stop going to bed so late, and get things like outfits and lunches handled the night before so my weekday mornings aren't filled with stress and chaos. Lately I've been re-watching the Gilmore Girls (thanks Netflix!) and I'm always amazed at how Rory has the time to get breakfast at Luke's every morning, catch a bus to Hartford and still make it on time for school, which I assume starts no later than 7:30 a.m. Sure, she wears a uniform, and most assuredly always orders hot lunch, but that would still mean being awake, dressed and functioning by 6 a.m. Plus the sun is always out and brightly shining at this time. Damn fictional television. 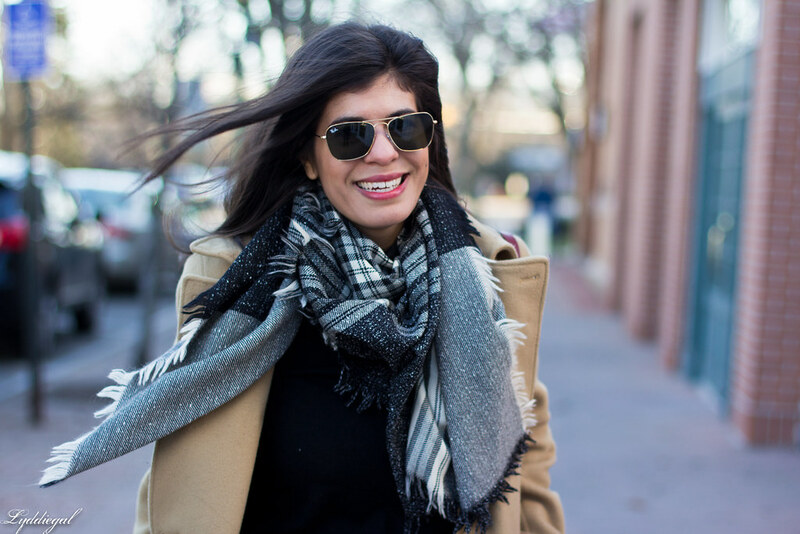 Loving that scarf, yay for borrowing from mom! Oh my gosh, wait. I too am re-watching Gilmore Girls, and Rory's lovely mornings annoy me SO much. Like, I'm sorry, NO. Hahaha! I leave for work everyday between 6-6:30 am everyday. I have to get ready within the confines of the bathroom so I don't wake any kids or the husband. I have to lay out all of my outfits for the week on Sunday including all undergarments, jewelry, sunglasses, bags, shoes, etc. I pack all lunches for me and the kids the night before. But there is no freaking way I would have time to "do breakfast" everyday. That is crazy nonsense! Take care of yourself! It is so underrated in our society! I get up at 5:15 am during the week and I would kill for an extra hour or so of sleep those days! It doesn't help that I can't being myself to go to bed before 10:30 or 11 pm so I'm always chronically tired. Here's to trying to take better care of myself! I hope you're feeling a little bit more energized after a restful day at home! Love the outfit and the vintage Coach bag! Such a chic, all-black look! I am constantly on myself to try and get to bed earlier, but it never works out! Love your coat and black jean combo so much. Ha ha, I love the reference to Gilmore Girls. I always assumed that Rory's school days must start later - when I was growing up we went to school from 8:50 am to 3:30 pm, which left all kinds of time in the morning to get ready and eat a proper breakfast. I've always blamed that short day for the fact that I can't fit everything into a work day in my adult life because I was not prepared to spend eight hours in one place during the day from childhood. Excuses, excuses, I know ;) But as for being exhausted, I completely get it, particularly being in the office this week instead of at home. I'm up at 6 am and usually in bed by 10:30 pm but it's not enough sleep or enough time for all the things I need to do, and putting together an outfit and make-up in the morning just makes things that much harder. (I've given up on lunch entirely - I just eat things I can transport like unsweetened apple sauce cups and instant oatmeal.) Maybe one day we'll get it sorted but for now it sounds like you needed a break, as we all do sometimes, and it's good that you took it. Here's hoping you have a restful weekend ahead! haha TV makes it all look so easy! Mornings can be hectic in our house. 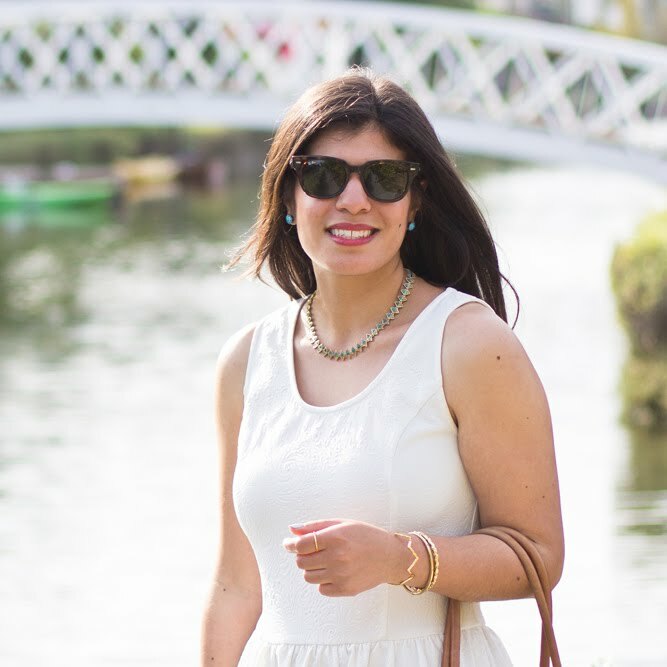 I always plan my outfits and lunches the evening before which helps so that I don't spend as much time rushing around the next day, but with the toddler deciding what time he wants the whole household to wake up I never feel particularly refreshed or organised, haha! 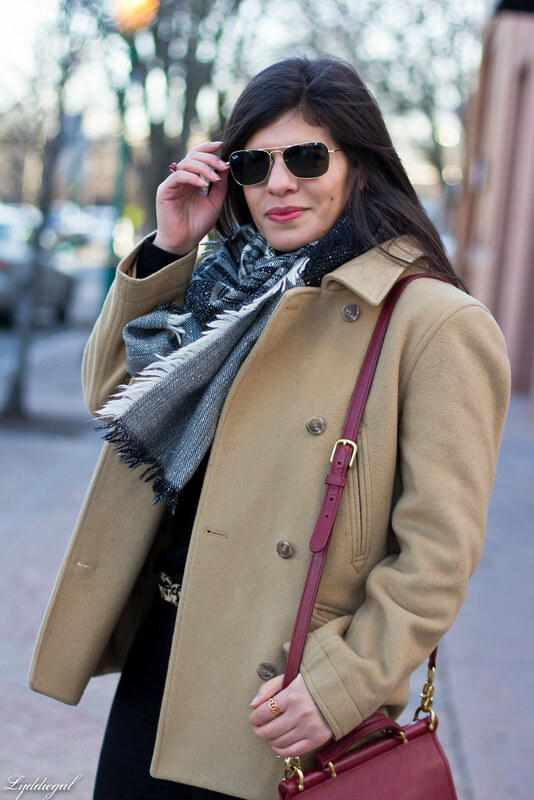 All black with camel is the perfect combo! Love this and your boots are gorgeous! Haha..I wish life was like a TV show! I never get anything accomplished in the mornings. I'm more of a night person but unfortunately that doesn't work well for outfit photos. Lately I've been resolving to take better care of myself too. It's amazing how TV shows convince us we can do it all -- most days I'm happy enough if the color of my socks match (and don't get me started on how unorganized I am when planning outfit shoots... my bed turns into a disaster AREA!). Glad to know I'm not alone! 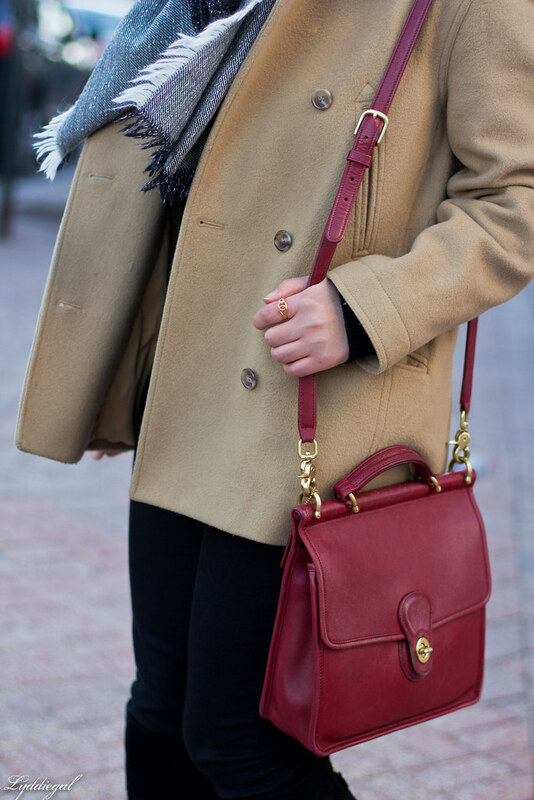 Love your vintage Coach bag too -- such a timeless piece! Hmm, the timing on TV does seem suspect but how else could they fit in all the witty banter? Aw Lyddie, I do hope you're taking care of yourself! It can get busy and I feel you right now with that, sometimes not getting enough sleep and running around all the time really takes a toll on you. Hopefully you'll feel better soon! 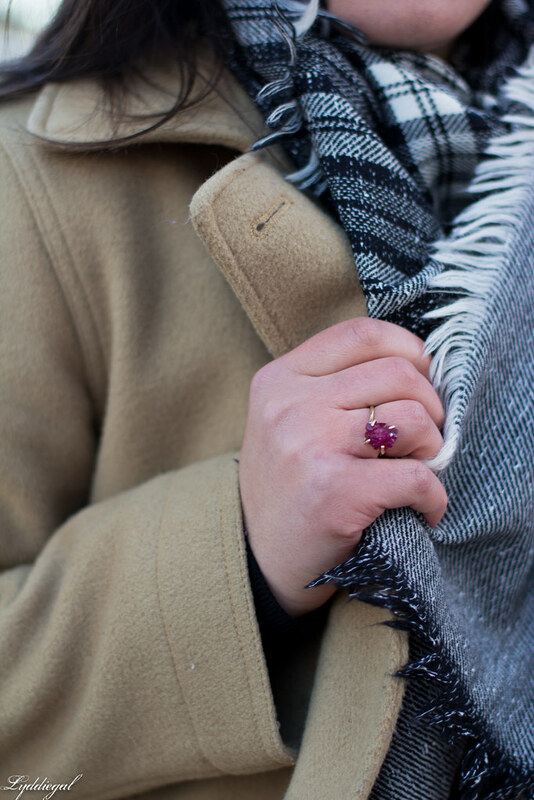 Oooooh, I love that little gemstone ring you've got! LOL, I never thought about that before on Gilmore Girls, but you're right--how DID she get all that done in the mornings? Good for you for taking a day and getting some rest--sometimes that's just what you need. Love this cute, classic look! I know, I am tired too. It's like there is no time for anything and its almost mid March WTF?! Well, you look beautiful here - you know that camel coat and red bag are one of my faves.